A surprising result and a surprisingly adventurous performance form Italy who stunned Sweden with their ability to attack effectively on the break. 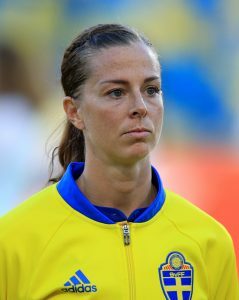 They scored some sweet goals and can go home proud, especially captain Melania Gabbiadini (who has played over 100 times for her country) who announced her retirement from international footie, after the match. SK: You end the group stage with what you needed, but after a 3-2 loss in which you’d come back twice, what are the main feelings at the moment? LS: Mixed. Of course, we wanted to win, but most important is that we are through to the quarter-finals, so we’re happy with that. We’re gonna take the things with us that we did well, so the most important thing was the quarter-final, and we’re there. SK: The first half, (Barbara) Bonansea for Italy was causing a lot of problems coming mainly off that left wing. What felt like it was making things difficult for you as a team overall? LS: They counter-attacked well and they were quickly there. They came forward with a lot of people and they punished us in a few situations, but in the second half, we scored quickly to get back in the game. We did that well and we had a lot of chances to score even more goals, so we came back and that was important. They came back too of course, but that’s football and we are now just thinking about the quarter-final. 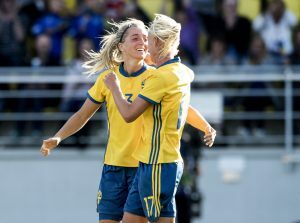 SK: At the end, what did Pia [Sundhage, Sweden coach], or any of the players, have to say? LS: It’s a choice; we are all football players and we don’t like to lose, but it’s a choice now how to feel, how to take it. So, as I’ve said, we’re choosing to see the quarter-final in front of us. SK: For you personally, coming off the season with Montpellier in which you qualified for the Champions League, how are you feeling right now with your own game and condition? Is this up there with the best you’ve felt? LS: Yeah, I’m feeling in a good shape. I have a good season behind me and I was feeling good when I came here. I hope that we continue for three more games. SK: And just a word for the Swedish support again here tonight, so many fans around the place leading up to the game, bringing that colour and energy. What do you say to them ahead of the last eight? LS: We’re really happy with all the people here, all the yellow shirts we can see. It shows that they are appreciating us and we’re appreciating them and that they are here and supporting us, so I hope that they stay and keep supporting us. 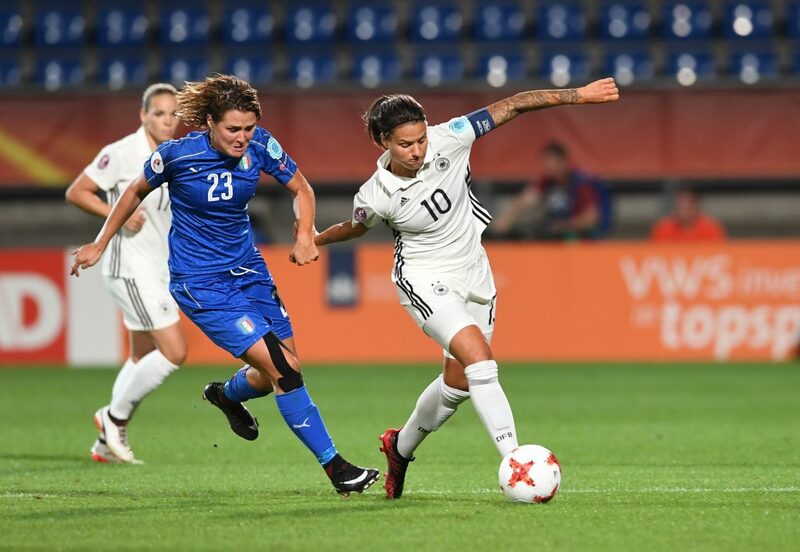 Germany’s Dzsenifer Marozsan in action against Italy’s Cristiana Girelli (L) their second group B match. SK: Despite the disappointment of going out, it was a great way to end it for the team and for you to score the winner. How would you describe your feelings? CG: Well, I have two different feelings, because I am happy with how we played tonight against a big team, but at the same time, I’m a bit sad because we go out, we go home, even if I think we didn’t deserve it. When you are playing at this international level, no-one can help you. I think it’s a good start and a good point to go away on and think of the future. SK: What were the biggest things you wanted to take from tonight, already knowing you were going home? CG: I think that every one of us wanted to express and show to the people who didn’t believe in us and this sport how much value the team has. Of course, we wanted to leave this tournament in a good way and I think we did it. Yeah, you are a bit sad, because I think we deserved more than this result. SK: For you to not only get to come on and play in the last game, but to score the winner, what does that mean to you? CG: Of course, it means a win, and I think Italy didn’t win against Sweden for a long time? For me, it’s the first goal in a Euro, in the final tournament, and yeah, it means three points and a win for Italy. SK: Do you feel you have had good support here in the Netherlands and back home, or is there still a way to go? CG: I think we had good support, because we didn’t know how many supporters we had, but tonight and against Russia and Germany, we had many supporters. I think I will miss this atmosphere for many days now. The hope is to relive this kind of emotion. SK: What would you like to see happen now in Italy to help women’s football? CG: I think now many teams are growing, because men’s teams are involved: Juventus, Fiorentina, Sassuolo now. I think it’s a good start to grow this movement, because we deserve more interest. If you think that we can get this kind of result with not so many resources, think how we can do if we have good ones. SK: For you now as a player, at this stage of your career (27 years old, spent entire club career in Italy, and with Brescia since 2013), what do you think you need now to reach your next level? CG: I hope to play in a different country, if possible, of course. I would like to grow up and to improve myself and my play, physically, technically, everything. I would like to go abroad but I don’t know what will be my future now. Now I will go back and have a think about it. SK: You just mentioned in another interview that you were replaying chances in your head after the game, how much does the happiness at progressing to the next round outweigh the frustration from tonight’s game? LS: We never like losing, you know, so that’s not what we wanted to do. Everyone was really frustrated after the game, so that’s normal, but now we can’t stay here; we can’t focus on our last game, we have to just focus on the next game and that’s against the Netherlands. We have all the chances in the world to beat them. It’s going to be a really tight game and two really good teams, so for us it’s really important now to recover and to change focus, go to that game and drop this game. SK: What about your own game tonight and also what do you think needs to be improved on for the next game, specifically? LS: I think I played well today. I played forward and then I went down to the midfield; I do the work for the team, so I felt good. A lot of things need to be improved, I think. It’s a totally new game [against Netherlands]; some new players starting, so it’s going to be a whole new game for us. It’s not important for us to stay here. I think the coaches will analyse and see what we can do better, but now it’s just another game.